Just began reading Karl Marlantes’ What it is Like to go to War (Atlantic Monthly Press, 2011). If you have loved ones who have served in combat I highly recommend you read this to understand a bit of their experiences. 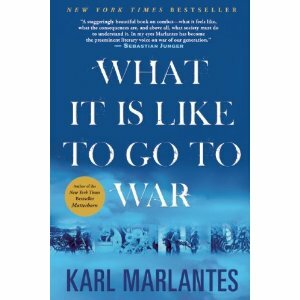 Karl Marlantes is a veteran of the Vietnam War and in this book details the spiritual and psychological impact of killing and combat. While his view of God would vary from most Christians, I think most believers will find his descriptions of war’s destruction on a person very accurate. Many will argue that there is nothing remotely spiritual in combat. Consider this. Mystical or religious experiences have four common components: constant awareness of one’s own inevitable death, total focus on the present moment, the valuing of other people’s lives above one’s own, and being part of a larger religious community such as the Sangha, ummah, or church. All four of these exist in combat. Consider the book if you live with, love, or work with a veteran of combat. Thank you so much for this post. Am I the only one who now wants to be a military chaplain? So sad that a person being paid to be a “spiritual guide” is unable (or unwilling) to bring the comfort of the Lord in the face of trauma. Can reading a book about “what is it like” be enough to cause trauma to someone who is already emotionally triggered by the subject because of having a loved one who is active military?